Duodenal Switch, also known as bilio-pancreatic diversion with duodenal switch (BPD-DS), is a rather new bariatric procedure. BPD-DS is gaining popularity because it has one of the highest expected weight loss as well as the most reduction in comorbidities compared to other procedures. 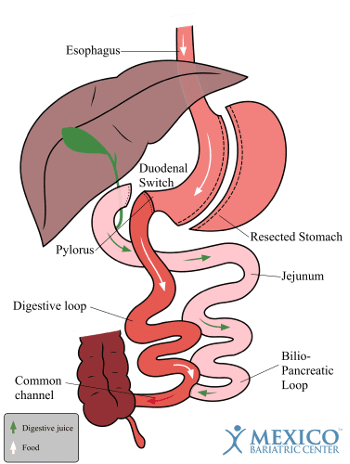 How Does Duodenal Switch Work? 1. Restrictive Component – Initially, about 70% of the stomach is removed by vertical division at the larger curvature of the stomach reducing gastric capacity and acid production. This restrictive portion of the duodenal switch creates a new “sleeve-stomach” almost identical to gastric sleeve surgery. Removing a large part of the fundus (top portion of the stomach) reduces the level of an appetite-stimulating hormone (hunger hormones – ghrelin) and changes the hormonal balance in the GI tract. Biliopancreatic Diversion occurs as all the digestive juices (bile and pancreatic fluids) from the first part of the small intestine (attached to the new stomach) is mixed at the last part of the small bowel, called the common channel (75 cm). The rerouting of the intestine reduces the time for food to be digested which results in fewer calories and fat being absorbed into the body. This malabsorptive component is similar to gastric bypass surgery and mini gastric bypass surgery. Changes in Anatomy – A significant benefit of the DS procedure is the preservation of the pyloric valve, leaving the bile, and pancreatic fluid intact. Preservation of the Pyloric Valve in the new smaller stomach prevents marginal ulcers and dumping syndrome experienced by patients with bypass surgery. Like gastric bypass, the duodenal switch is restrictive and malabsorptive. The first two parts of the small intestine, i.e. duodenum and jejunum, are bypassed significantly reducing absorption of nutrients causing weight loss. This procedure is so efficacious than 98% of patients with type II diabetes, 70% of patients with high blood pressure and a 75% of patients with high cholesterol are “cured” after the surgery. Is Duodenal Switch Right For Me? Duodenal Switch is a viable option for people with significant weight to lose. The DS has the best long-term weight loss results among all of the weight loss surgical procedures. The super obese patients and patients with a failed sleeve or band surgeries can benefit from this surgery. In patients with super high BMI, it is recommended that they do DS in two stages. First, the gastric sleeve restrictive stage to lose weight (about 60 to 80 lbs). Second, rerouting the food to bypass a portion of the small intestines induces malabsorption and increases weight loss. Patients typically are needed to have a body mass index of 45 or more. Patients with BMI of 35-40 can be candidates for the duodenal switch as long as they have co-morbidities including type two diabetes, hypertension, high blood pressure, or other diseases. The BPD/DS procedure takes over 3 hours from start to end, depending on the patient’s BMI and the surgeon’s skills and experience. Mexico Bariatric Center keeps the patients 3 nights in the hospital. Healing is rather fast, and patients can return to work after two to four weeks following the surgery. Duodenal Switch is somewhat reversible; the malabsorptive aspect can be reversed, and then act like a gastric sleeve surgery. Patients can consume a broad range of foods, similar to gastric sleeve. Dumping syndrome is a lot less common, unlike gastric bypass surgery. Requires lifelong dietary supplements to combat the malabsorption. The stomach increases in size and does not reverse. Anemia – lack of enough healthy red blood cells or hemoglobin. Gallstones are somewhat common with duodenal switch, as with another weight loss surgery. Patients to absorb 20% of the fat they eat. The failure to absorb fats prevents absorption of the fat-soluble vitamins, such as vitamin A, D, E, and K.
Patients to absorb approximately 60% of the protein they eat. Therefore, patients need to consume between 80-120g of protein a day. Patients to absorb 60% of complex carbohydrates and 100% of simple carbohydrates. You should eat nutritious meals that are high in protein, along with fruits, vegetables, whole grains, and omega-3 fatty acids. You should avoid meals high in sugar. The duodenal switch surgery is the most expensive procedure compared to the gastric sleeve and gastric bypass. It is a more complicated surgery, and only a small percentage of surgeons can perform this procedure. Self-pay U.S. patients can expect to pay $24,000 to $32,500. 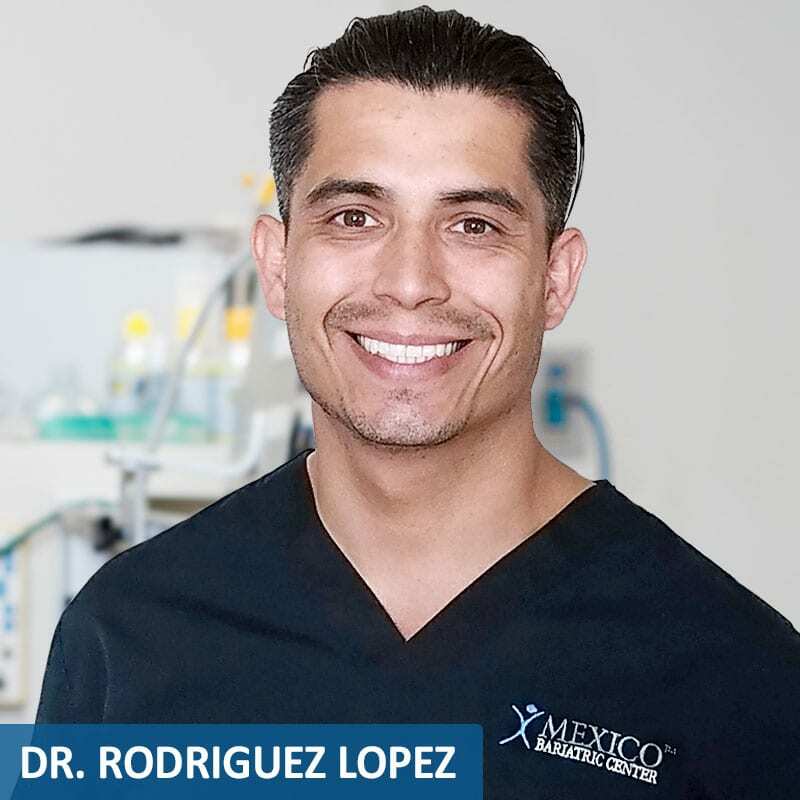 The cost of duodenal switch surgery in Tijuana, Mexico will be considerably less than the U.S. and Canadian counterparts. Mexico Bariatric Center offers duodenal switch surgery starting at $6,995. Most patients will pay typically 1/3 the cost of the cost in the United States. Please contact our staff today to find out our exact cost for duodenal switch. We have helped hundreds to get on the loser’s bench and change their lives forever. See why you should contact us first! Due to the intestinal re-routing, stools tend to be stronger smelling as in the case of gastric bypass. The stool gets loose if the patient consumes too much fat. Consuming too many carbohydrates, fiber, and carbonated drinks may worsen the flatulence. How Is Duodenal Switch Performed? These are the specific steps our surgeons use to ensure the highest level of safety and results for patients. The patient is placed on the surgical table with the face-up and the arms spread apart. The anesthesiologist starts the general anesthesia and inserts a breathing tube into the windpipe. Small incisions (normally 5) are made in the abdomen area to access the abdominal cavity. Trocars are inserted through the incisions as a surgical instrument access port. The abdomen is inflated with carbon dioxide (CO2) gas to create space for surgery. The laparoscope camera is inserted into the trocars to view your organs. Small surgical instruments are introduced through ports to perform the surgery. The retractor is used to lift your liver. The first part of the surgery is performed by removing approximately 70% of the stomach, leaving behind a new small sleeved stomach. An Endoscopic Cutter/Stapler cuts and staples the stomach along the greater curvature sized by the bougie inserted through the mouth to form the new stomach. The GI tract is diverted beyond the first two parts of the small intestine (60% of the small intestine), duodenum and jejunum and hooks up with the ileum – the last part of the small intestines. The small intestine is detached from the new stomach at about 3 cm below the pyloric valve. The final segment of the small intestine (40% of the small intestine called ileum) is attached to the new stomach. Upon completion, the small incisions are closed by dissolvable sutures. The surgeon leaves a drain in the abdominal cavity to detect any possible leaks after surgery. Duodenal Switch surgery can be performed open or laparoscopically. In open (traditional) duodenal switch, a long incision is made in the abdomen area. Open bariatric surgery procedures are no longer performed by surgeons in the U.S. and Mexico. Laparoscopic surgery is a modern surgical technique that helps faster healing, less trauma to the body and fewer complications. In the laparoscopic duodenal switch procedure, also called Minimally Invasive Surgery (MIS), five small incisions are made in the abdomen. Single Anastomosis Duodenal Switch (Single Anastomosis Duodeno–ileal Bypass with Sleeve Gastrectomy, SADI-S) is a new type of DS surgery that uses a single anastomosis (reconnection process). In Single Anastomosis DS, there is only one surgical connection between the stomach and the small intestines, as opposed to two in the classical DS. This new procedure is showing promising results. + The total length of the small intestines varies from patient to patient, averaging about 6 meters, or 20 feet long. * Prices are subject to change. Not valid on blackout dates. Prices depend on the surgeon, surgery, additional fees, and schedule. Prices may rise because of BMI level and previous abdominal surgeries. ** All of the testimonials are covered in our disclaimers. Individuals results will vary; there is no guarantee stated nor implied. Last Updated: March of 2019, by Ron Elli, Ph.D.